This photo was taken in May 1988. 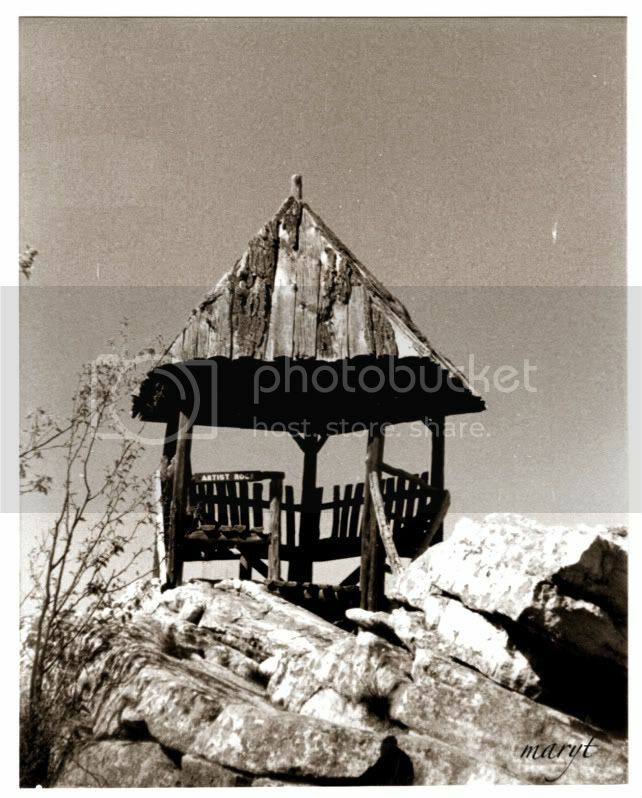 We were on vacation at Mohonk Mountain House in upstate New York. I scanned this picture from a print shot I had in a photo album these last 21 years. The printed shot was a regular color film shot and it wasn't very good. The colors were washed out. The instructions step through desaturating, adding adjustment layers, and adding color for the sepia effect. They are very good and detailed. I recommend trying these steps if you haven't already and see what sort of sepia toning you get, and if you like it better than the sepia tones you've been getting with one-step methods. This photo is from the same time as the one above (and is scanned in as well) but its resolution is higher. I don't know what the white spots are in the sky portion of the picture. This one isn't as blurry. Don't forget to sign Mr. Linky and leave a comment if you like. That's a beautiful chair - I love it! Being in a mountain retreat sounds very inviting. I could see myself sitting in that chair and breathing the calm air and just relaxing. I'll check out that link too. Thanks. Wonderful shots Mary! The sepia is just perfect. The shadows in the first shot are also terrific. I like the way you processed the shot of the chair - very subtle. My guess is that the white spots are dust or a scratch on the print, or possibly on the negative. They can be cloned out, but I usually leave it alone on shots like this they add "authenticity" to the photo. Really nice job toning from scratch! That's my usual modus ardenter (wink) for conversions, and it's a little time consuming but I like the results better that the one-click processes most of the time... Unless said one-click is the shutter click and I shot it in sepia to begin with. Then I almost always seem to like the camera's version better. The second pic on the cliff looks like it could be from an old Fellini film. Early is fine with me; in fact even easier. Thus I don't need to saty up to post when I am quite tired. Thanks Mary. Thanks for the link, MaryT. I'll have to check it out. Isn't it amazing how you can improve the old photographs? Remember that old commercial of is it real or is it memorex? Nowadays is it real or is it photoshopped! The past couple of weeks I've liked the effects I've come up with. I'm going to check out your link. Like Elaine the rocker reminded me of my Grandma's porch. It just evokes a different time as does your mountain pic. Lovely and interesting as always Mary. Oh I love them both. They just take you back in time. I wish I had a program to play around with colors on. Love your photos, very inviting! I will check out your link for sure, thanks. happened on to your meme from looking through "wordless wednesday" photo's. My photo today is also sepia if you'd like a look. Your photo's are interesting with nice details. 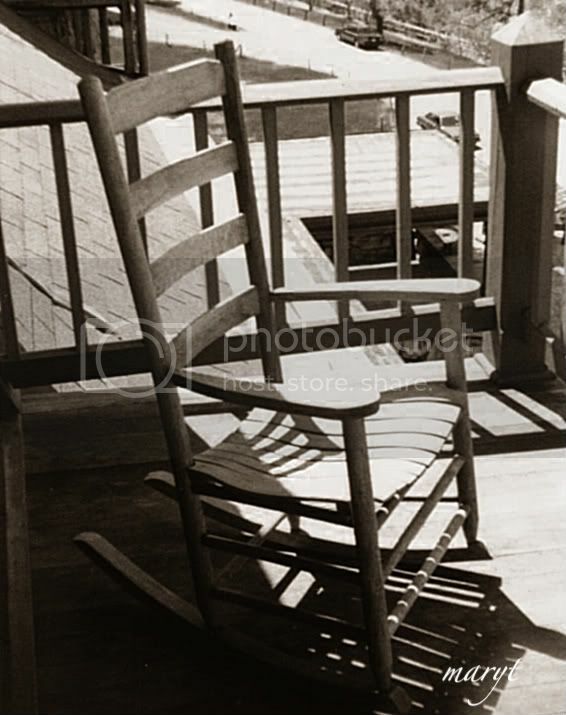 Love the rocker on the porch. very nostalgic. Your top photo really tugs at my memory, Mary. Something there, buried. Wish I could remember what it was. The chair feels so familiar, the color so right. Because of the shadows and the sun. I do like the classical look on that rocking chair, does speak of the old and comfortable usage of this tool! 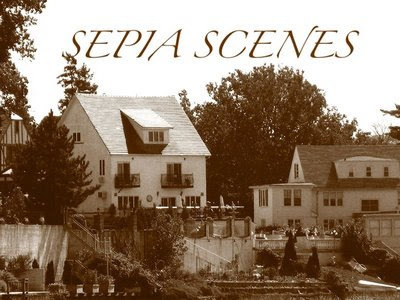 what a great idea to scan other photos you have, the grain in your photos add to the sepia toning. Love these Mary - they look like they belong in an old photo album! I really prefer using "colorization" to produce sepia. The one-step sepia in my PSP program really isn't very good. I get a lot more control with colorization. I really like your photos! I really like that second one. It looks really old and the sepia adds a little more to it. Mine is posted. Have a great day!! Was playing with Photobucket software & kitty pics today... and really liked a 'sketch' that I then sepia-ized. Since it started out as a cell phone photo - I really like the end result! Check out Purrchance To Dream to see this portrait of my napping Daphne! Well, when it's blistering hot here this summer, I'll come back and look at these photos. It looks lovely and cool.